In the morning, we rallied with elected officials, both Republicans and Democrats, environmental allies, and zero waste advocates from across Maryland to demonstrate that everyone can support putting our renewable energy money where it belongs: in truly renewable energy, not trash incineration. Read more here, and watch the press conference here! Then, after visiting the offices of every state legislator with information about the legislation, we spoke out at the public hearing along with close to 20 individuals from Baltimore City, Montgomery County, and Carroll County. Read our testimony below! Clean Water Action is a grassroots environmental nonprofit with approximately 60,000 members in Maryland. We strongly urge you to support HB961 and remove trash incineration from Maryland’s Renewable Portfolio Standard. The Renewable Portfolio Standard was enacted in 2004 to facilitate a gradual transition to renewable sources of energy, and the energy sources it supports should be renewable, without climate change emissions, and protective of public health. However, trash incineration emits greenhouse gasses that contribute to climate change and local air pollution that do measurable harm to Maryland communities. This legislation will not cause Maryland’s incinerators to shut down. However, it’s important to note that disposing of Maryland’s waste in landfills is not the only alternative to the Montgomery County and Baltimore City trash incinerators. Alternatives like composting, recycling, and reusing materials are already in existence across Maryland, and create more local economic benefits than trash incineration. According to the Institute for Local Self-Reliance, per ton of waste processed in Maryland, composting already “employs two times more workers than landfilling, and four times more workers than incineration. On a per-capital-investment basis, for every $10 million invested, composting facilities in Maryland support twice as many jobs as landfills and 17 more jobs than incinerators." And there is much room for the sector to grow, as communities all across Maryland are actively working to increase recycling, composting, reuse, and source reduction. In Frederick County, Wheelabrator and the Northeast Maryland Waste Disposal Authority proposed to build a new trash incinerator to dispose of Frederick County’s and Carroll County’s waste over a decade ago. A powerful bipartisan coalition formed that ultimately prevented that incinerator from being built; then, the County convened a working group titled “What’s Next” to determine how to manage its solid waste. These recommendations did not include new or expanded landfills; instead, the main finding was that organics diversion and community composting sites would make a lot of sense as a first step toward zero waste, as well as a resource recovery park and waste reduction programs at county schools to reduce the County’s total volume of waste. Now, organizations like the Frederick Zero Waste Alliance and the Frederick Compost Working Group are working to make many of these solutions a reality. The Frederick Compost Working Group is an ad hoc group of citizens who came together about a year ago to help with pilot programs that would assist Frederick County's organics diversion and composting efforts. 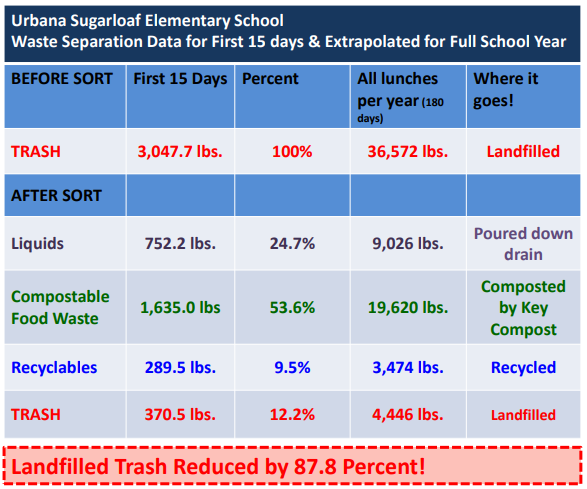 Through working with students at Urbana Sugarloaf Elementary School, the Working Group found that 87% of the school’s trash could be diverted from the landfill; and the organization is working to bring the same program to schools across the county. Carroll County, faced with the same choice as Frederick, also decided not to build an incinerator to handle its waste. Its Solid Waste Advisory Committee is now pursuing zero waste alternatives, such as a New Windsor is piloting a “pay as you throw” program in the town of New Windsor that, as of January, resulted in a 44% decrease in solid waste thrown away by residents. Baltimore City, home to the BRESCO trash incinerator operated by Wheelabrator, is also home to a thriving Zero Waste community working to reduce the city’s solid waste volume and increase composting, recycling, and reuse programs. Mayor Catherine Pugh has pledged to close the BRESCO trash incinerator and increase recycling and composting rates, a commitment the City Council has echoed. In April 2017, the Baltimore City Council passed a resolution calling for Baltimore to “develop an effective, long-term, plan to move toward Zero Waste to support the continued health, well-being, and prosperity of our residents.” Then in January 2019, the City Council passed a resolution calling on the General Assembly to remove financial incentives for trash incineration in the RPS. City plans back up this commitment to transition away from trash incineration. Baltimore’s 2019 Sustainability Plan includes the goal of diverting 90% of the city’s waste from incinerators and landfills, and this is an achievable goal. According to the Baltimore Office of Sustainability’s 2014 report, “Waste to Wealth: Baltimore Waste Stream Analysis,” 82 percent of Baltimore’s household materials could be recycled or composted. Montgomery County, home to the Dickerson trash incinerator operated by Covanta, has repeatedly indicated its determination to close the incinerator and move toward zero waste alternatives. County Executive Mark Elrich pledged repeatedly during his campaign that if elected, he would close the Dickerson incinerator by 2022, and has reiterated that promise since his election. Likewise, Montgomery County already has a goal of increasing its waste diversion rate to 70% by 2020 and has made strides toward increased recycling and composting. Prince George’s County has likewise been actively pursuing waste reduction. The County’s Waste Characterization Study determined of the 304,000 tons placed in the landfill annually, approximately 234,000 tons can be composed, recycled or diverted – approximately 77%. The Resource Recovery Master Plan calls for increased recycling, increased food waste diversion, increased reuse of divertible materials, increased source reduction, and efficient and effective waste disposal management as methods of meeting its Zero Waste Initiatives. The County is home to the East Coast’s largest composting facility and already boasts the highest waste diversion rate in the state: a distinction that, given the thriving composting plans and programs across Maryland, may be rivaled soon. Landfills are not the only alternative to trash incineration: communities all across Maryland are actively working to enact zero waste programs that reduce the need to both landfill and burn our waste. We don’t need to incinerate our trash; and we certainly don’t need to give incinerators subsidies they don’t deserve. 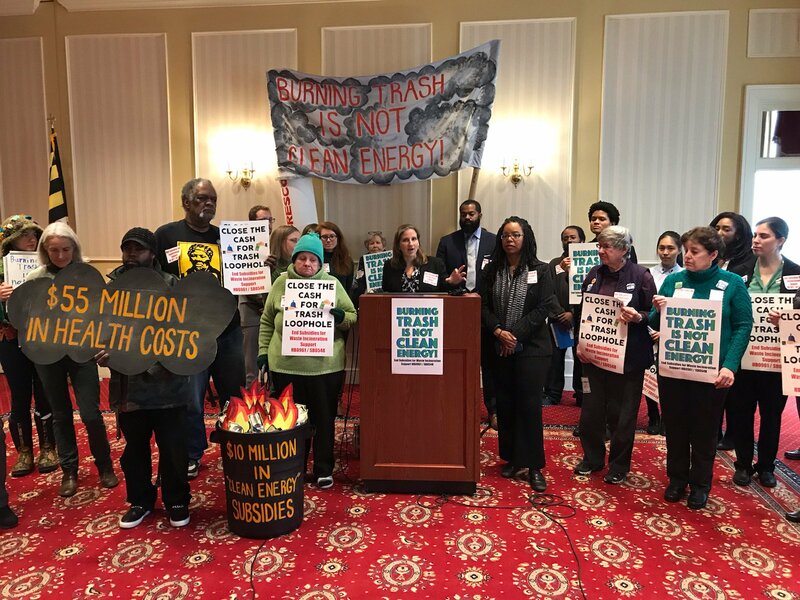 On behalf of our 60,000 members in Maryland, we urge you to support HB961 and put Maryland’s clean energy subsidies where they belong: in truly renewable energy, not the polluting practice of burning our trash. Thank you.